Returning to the era of burlesque, 'Peep Show' is now available. is a voluptuous tease, tantalizing lashes to further greatness and a truly mesmerizing effect. A gentle wave of her wand adds instant volume and builds the lash from base to tip, coat after coat with no clumping. is the ultimate eye-opener, seductively bending the will of most stubborn lash and delivering an eye-enhancing curl that lasts throughout the day. Her super flexible film and elastic formula both lengthens and lifts while she coaxes lashes into good health with a dose and much needed moisture. 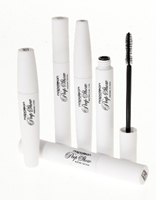 is the purveyor of possibility, extending your eyelashes to unbelievable lengths. Gently wrapping herself around each and every lash, she manages to coerce one and all into extending themselves beyond their natural capabilities. The pay off is the long, lush lashes you've always wanted. loves lashes like no other and is truly the best base. A low profile performer, she sweet talks your favourite mascara into wilful over-achieving. Thanks to her blend of natural waxes and a balance of special nylon fibbers she builds body (without careless clumping) and instantly enhances your flutter factor. is the mistress of disguise - and descretion. A truly smooth operator, she works her magic thanks to a clever formula that separates, hydrates and defines lashes, opening up the eye area with a luminous and natural finish like a good mascara should. And all without a tell tale trace.